I SHOULD REALLY BE DRAWING: Illustration Friday - "Mirror"
This week the theme was "Mirror" and I was inspired by the scene in Jurasic Park when they are being chased by the T-Rex. 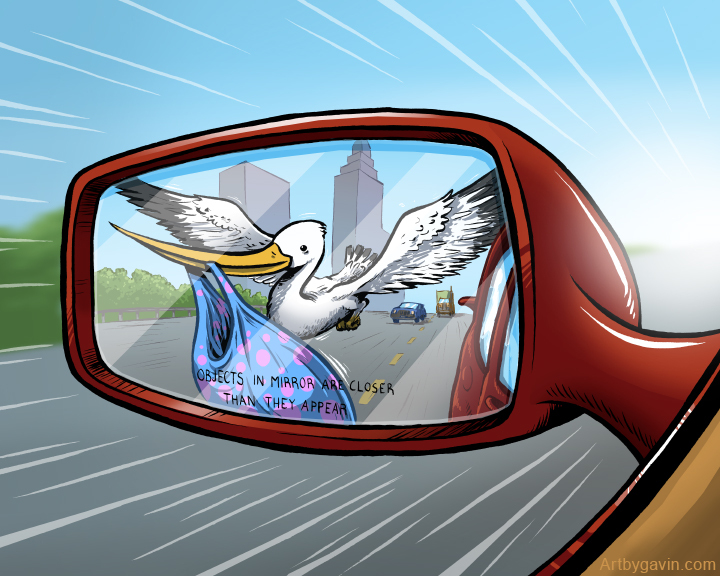 The shot of the sprinting dinosaur in the side-view mirror was such wonderful juxtaposition that I couldn't help by play with the idea of "stuff you shouldn't see in your side-view mirror". Here is what I came up with. -Someone fleeing their impending parental responsibilities (no, we're not expecting). -Stork delivery regulations on highway. -How to explain where babies come from to a child who was born in the back of a car on the way to the hospital. Truth be told, I just think it's a fun image.